Upgrading to high-efficiency air conditioners and furnaces that are sized right and installed properly after the structure has been tightened and well-insulated is key to a comfortable Kansas City area home or building. According to Energy Star data, the EPA and DOE (Department of Energy) at least half of the energy used in your home goes to heating and cooling. So making smart decisions about your home’s heating, ventilating, and air conditioning (HVAC) systems can have a big effect on your utility bills — and your family’s comfort. Before you invest in any heating and cooling installation or replacement, it makes sense to determine how well your home or building is sealed against air loss, how well it is insulated and how well sized, installed and sealed the duct work is. Unless your furnace and AC are dead or failing, you’ll want to improve the efficiency of the home or building structurally before you spend money on high efficiency HVAC systems. Home Performance Services Kansas City can help you find the right equipment–furnaces, boilers, air-conditioners, heat pumps–but that is only a small part of the service. We make sure the equipment is properly sized and installed so you get the performance, comfort, and savings you deserve. 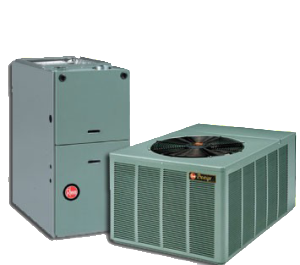 When it comes to furnaces, boilers, and air-conditioners, bigger usually doesn’t mean better. But often heating & cooling installers simply “brute force” engineer heating and cooling systems to try and solve comfort issues instead of creating a more efficient environment for the system to operate in. You need equipment that is “right-sized.” If the unit is too large for your home, you will not only pay more up front, but you won’t get the comfort or efficiency you expect. Don’t assume that the size of your new system will be the same as your old equipment. Original equipment may have been over-sized from the start, and there is no way to figure this out over the phone! And with improvements in insulation, air-sealing, windows, and other changes, as well as carefully testing and measurement, Home Performance Services is often able to significantly downsize furnaces and air-conditioners. Home Performance Services can assist you with all your heating, air-conditioning and water heating needs. For a FREE equipment inspection, give us a call now at 816-746-0002 or 913-708-8888. 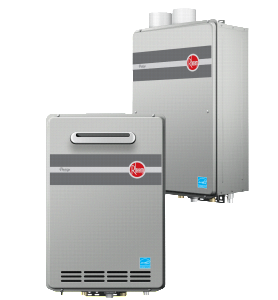 Home Performance Services proudly sells, installs and services high quality equipment from Rheem and is a Rheem Team installation and service partner.